Ok, let’s face it heads-on: As you are reading these lines, we are living in one of the most favorable conditions of Entrepreneurship the World has ever seen. The world is connected with a huge web of technology, 25% of the world population has a smartphone and with Facebook and Twitter, almost everyone has become a media outlet. If we talk about India, then you shouldn’t be surprised to know that we are right now fastest growing start-up ecosystem in the world, and world’s third largest in terms of sheer numbers! This year, netizens of India will shop Rs 50,000 crore worth of goods and services online, and by 2018, this is expected to cross Rs 1 lakh crore. And we have not even crossed 10% of the retail which happens in the country. Not only online, but startups in offline world are also booming and making us proud. As per our analysis, more than Rs 12000 crore of funding has already been accomplished this year, and the funded startups are from various different niches. We should be proud to know that one of the Indian startups: Team Indus is about to land in moon, and Google have awarded them with venture capital! 4 The Most Important Question: Why? In the exciting world of entrepreneurship, an idea and an insane passion are not the only things which are required to make it big. Although it can propel you to start but it’s the knowledge and experience which matters. And often budding entrepreneurs fall short of this factor which stops them from even starting out. A new entrepreneur’s mind is always buzzing about these questions: Should I even be an entrepreneur? How will I contact VCs? Will they give me funding? How to pitch in my idea for funding? What is revenue, what is profit? How to calculate equity for my co-founder? How to recruit? How to market? Will the market accept my product/service? What is the difference between a product and service? Should I rent an office or co-working is fine? 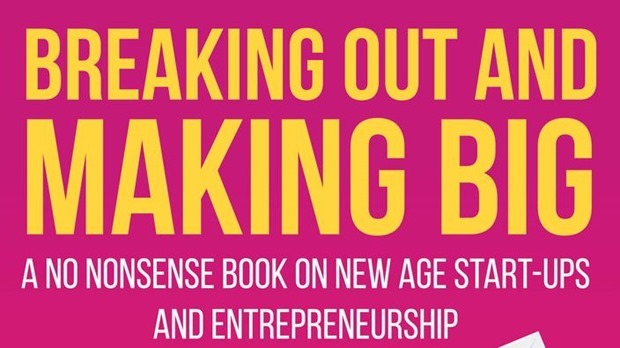 Understanding this major gap in knowledge and passion, Rudrajeet Desai, an entrepreneur and founder of a VC backed startup decided to provide firsthand experience and knowledge of his journey via a book: Breaking Out and Making Big. We reviewed the book, and found it to be a first class resource and blueprint for every entrepreneur – be it experienced or newbie. It can act as a roadmap for everyone who is confused about the above questions related with startups and especially about funding. Before you purchase any book, it is very important to know who is author is, and what credentials he has to offer you suggestions. Rest assured, this book is coming from a veteran of entrepreneurship, all right! Rudrajeet worked with GroupM earlier, and quit his job to start iCafe Manager, which is India’s largest cyber café management and advertisement platform right now. They have more than a hundred employees across 4 offices, and cover 300 cities and have collaborated with 250 companies for advertisement solutions. Funded by Sequoia Capital and Saama Capital, iCafe Manager boasts of clients such as Microsoft, Google, Facebook, Yahoo and lot more. This book has been written from his personal experience of founding a startup, inviting venture capital and expanding it to a point wherein it’s regarded as a market leader. What better way to learn about entrepreneurship and funding, wherein a person who has ‘seen it all’ pens it down in the most transparent manner, and allows a new dimension to term ‘mentorship’ and guidance? More than anything else, the entrepreneur needs to answer the “Why” part in the beginning itself. Why are you trying to become an entrepreneur? Why entrepreneurship? In the second chapter of the book, Rudrajeet shares 25 most important qualities which a person should have in order to become an entrepreneur. And in my view, this is one of the most fascinating part of the book. Not only the newbie entrepreneur can clearly retrospect about this future goals and aspirations, but also he will get crystal clear about his idea and passion. Not only an entrepreneur, but I believe that every artist, freelancer and ‘creative’ person should read these 25 questions about ‘Why’. In the 5th chapter of the book, Rudrajeet gets into the shoes of a VC, and tries to demystify the secrets of funding. He shares some of the most intricate, ‘insider’ details about venture capital funding and helps you to discover the alchemy of venture funding. Perhaps the most important part of the book is the section wherein the author shares 99 questions which every VC asks before funding; and trusts me, if you have answers to these 99 questions, then there is no power on this Earth which can stop you from reaching your goal. In a blog post on Rodinhoods, he has shared even shared those 99 questions. But to find the real answers, you have to read this gem of a book. In the other sections of the book, Rudrajeet shares other crucial aspects of entrepreneurship, which includes (but not limited to): the secrets of recruitment (the author says, “Don’t hire people but build a great team”); time management, the magic of marketing, how to choose the right business, determining the business model and more. There is no question whether you should buy this book or not; the real question is how soon can you buy this book, and leap into the world of Entrepreneurship where sky is the limit and passion is the fuel. I highly recommend this book for entrepreneurs – both old and new; and the agents of the connection economy. Rudrajeet’s Breaking Out and Making Big can help you and guide you to greatness. "Confused About Entrepreneurship, Funding & VCs? 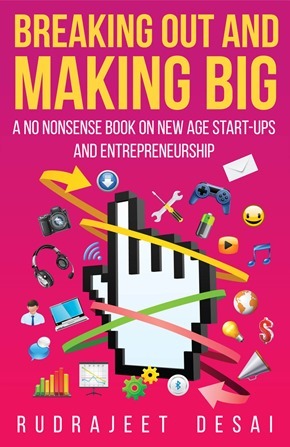 “Breaking Out And Making Big” Can Help You [Book Review]", 5 out of 5 based on 1 ratings.